Upstate Meow is a feline exclusive salon. You never have to worry about your kitty being around dogs! Hours of Operations Tuesday- Friday 8:30 until 2. Saturday 9:00 until 3. We are located in the corner of Highway 14 and Pelham Road. Our salon is attached to the Rocky Road Veterinary Resort on 111 Ebenezer Rd , Greer SC 29651. Grooming is made by appointment only. You can make an appointment by calling (864)-520-1545 or by clicking the book now button. Matt fee will be applied when matting is present to any groom. Long-Haired Full Coat Grooms include nail trimming, ear cleaning, bath, blow dry, comb out and sanitary trim. Prices start at $62.00 and can increased based on any matting. Short-Haired Full Coat Grooms include nail trimming, ear cleaning, bath, blow dry, and comb out. Prices start at $48.00 for cats under 12lbs, and $62.00 for cats over 12lbs. The Lion Cut is a short trim that is very close to the skin. It can be done to remove uncomfortable mats and tangles or to prevent them from forming. Lion Cuts start at $87.00 and can increase depending on matting severity and bite surcharge may be added if the cat is biting due to severe matting. The Comb Cut is a teddy bear-style trim that leaves the coat 1/2" to 1" in length. This is a great option to keep long-haired cats low maintenance and prevent matting. Comb Cuts start at $98.00 and can increase depending on any matting. Tired of wearing your kitty with you everywhere you go or vacuuming a cats worth of hair a regular basis? Our de-shed treatment removes dead coat and can eliminate up to 80% percent of shedding. De-shed treatment includes bath, nail trimming and ear cleaning. Are fleas ruining you and your kitties life? Let up help with our flea treatment! We use cat safe shampoo to kill the fleas and follow up with a medicated shampoo to help soothe kitty’s itchy skin. We recommend to have a follow up treatment 2-3 weeks later. 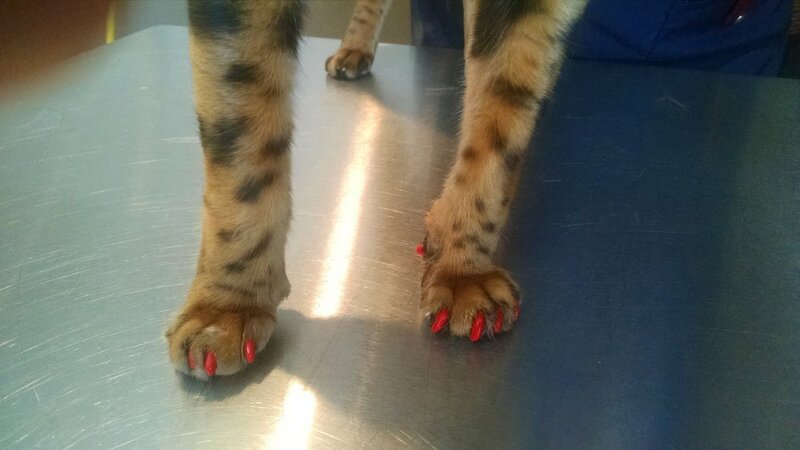 Soft Paws can be applied to front and/or back nails to reduce damage done from sharp nails. They are completely safe for cats of all ages. Nail caps should be replaced every 4-6 weeks. Nail cap application can be a stand alone service or an add on. 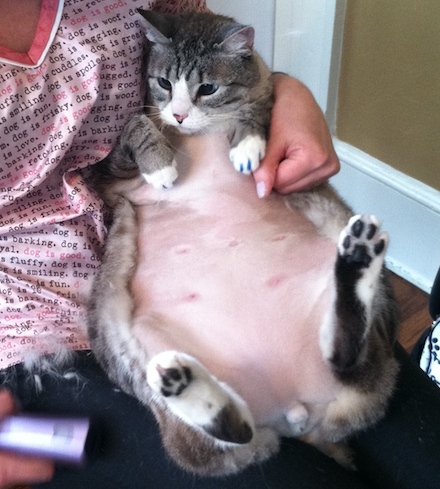 Belly Shaves are great for larger cats to keep themselves clean and for cats of all sizes to prevent tangles. This service is an additional $10.00 to any full coat groom. Our toe tuff trim makes your kitties paws smooth and round. Good option for kitties who get litter stuck in their paws. $18.00 add on to any service. Matting surcharge starts off at $35 for tangles and minor matting up to $100 for severe matting.